Madhya Pradesh Chief Minister Shivraj Singh Chouhan, who is vegetarian, has instructed officials not to include eggs in the anganwadi midday meals, leading some people to ask, "What about protein?" Do not be fooled. Vegetarians get protein from the same source that vegetarian animals such as elephants and rhinos get it -- from plants. Madhya Pradesh Chief Minister Shivraj Singh Chouhan, who is vegetarian, has instructed officials not to include eggs in the anganwadi midday meals, leading some people to ask, "What about protein?" Do not be fooled. Vegetarians get protein from the same source that vegetarian animals such as elephants and rhinos get it -- from plants. An egg has only 6 grams of protein as admitted by The American Egg Board. According to Physicians Committee for Responsible Medicine, a half cup of tofu contains 19.9 grams of protein, one cup of boiled lentils contains 17.9 grams, one cup of boiled black beans 15.2 grams and one cup of boiled chickpeas 14.5 grams. Do the math, and it's not hard to see that a child can get more protein by eating a healthy meal of plant-based foods. Plants also contain the fibre, vitamins and minerals a child needs. An egg, on the other hand, has no fibre whatsoever, and more than 60% of its calories are from fat -- a large portion of which is of the saturated kind. "The idea that eggs are good for our health is an outdated, dangerous myth." The Madhya Pradesh midday meal includes a variety of vegetables, including greens, potatoes, chickpeas, lentils and soya. These foods are packed with protein and other nutrients and are perfect for a growing person. Plant nutrition expert and former member of Whole Foods Market Scientific and Medical Advisory Board Dr Scott Stoll tells us, "All plants contain protein and at least 14% of the total calories of every plant are protein. Broccoli contains more protein per calorie than steak and, per calorie, spinach is about equal to chicken and fish. ... Multiple studies have shown that if you are meeting your caloric needs through plant-based nutrition, you will satisfy your body's protein requirements." The idea that eggs are good for our health is an outdated, dangerous myth. Just one egg has more cholesterol than our body needs in a day. Studies show that regular egg consumption can increase a person's risk of cardiovascular disease by nearly 20%, the risk of diabetes by nearly 70%, the risk of prostate cancer by over 80% and the risk of colon cancer by nearly five times. Eggs are also often the culprit in salmonella infections, a serious type of food poisoning. So if children are healthier not eating eggs and obtaining their protein elsewhere, what else do they need to stay healthy? A Population Reference Bureau publication states, "The World Health Organization estimates that 50% of malnutrition is associated with repeated diarrhea or intestinal worm infections from unsafe water or poor sanitation or hygiene. Stunting can stem from enteropathy, a chronic illness caused by inflammation that keeps the body from absorbing calories and nutrients. Children who are exposed to open defecation or who don't have a clean water supply may ingest bacteria, viruses, fungi, or parasites that cause intestinal infection; chronic inflammation in a child's gastrointestinal track is linked to stunting and anemia, and puts children at risk for poor early childhood development". "[T]he way to ensure children's health lies not in eggs, but largely in a hygienic, healthy home environment where women are empowered to make decisions that are right for themselves and their children." The publication goes on to explain that gender inequality also plays a role in malnutrition, saying, "Researchers have found that women's relative bargaining power within the household determined how resources are directed to support feeding practices, prenatal and birthing care, and treatment for illness and immunisations". So the way to ensure children's health lies not in eggs, but largely in a hygienic, healthy home environment where women are empowered to make decisions that are right for themselves and their children. Chief Minister Chouhan's decision not only teaches children that eating right is important but also teaches them the important lesson that animals matter. 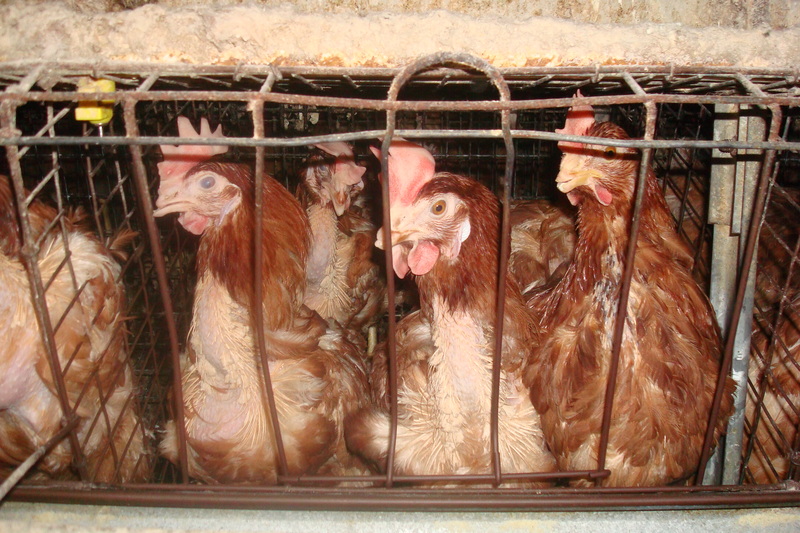 Chickens used for eggs are among the most abused animals on the planet. Most are forced to live their entire lives in an area smaller than the size of an iPad screen. Their beaks are typically cut off with a hot blade to prevent them from pecking each other in frustration, because the industry simply won't give them more space. At the end of this miserable existence, they are killed -- and in India, that often means with a dull knife, while they are still conscious and in full view of their companions. For more information on the benefits of a plant-based diet, order PETA's free vegetarian/vegan starter kit.